The role of supply chain has evolved from being a facilitator of the product flow to acting as a smart knowledge base to guide primary needs of businesses. The digitization of key financial and business processes spanning supply chain is proving to be a disrupter in the marketplace today. In order to generate a new wave of productivity, enterprises need to reframe their supply chain strategies that go hand in hand with the current technological trends. The revised framework of supply chain should strike a balance between business priorities and cost savings for enterprises. Organizations are hunting for solutions that are digitally ‘equipped’ as well as truly integrated to bring in flexibility, agility, and real-time visibility into their production and distribution channels. A number of solutions have proliferated the market, empowering businesses to unite not just physical flows but also talent, information, and finance. These solutions also secure data exchange and bring traceability between disparate systems across multiple supply chains. 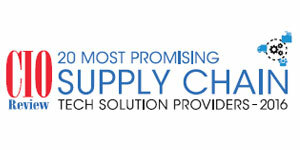 In the last few months, we have analyzed hundreds of supply chain solution providers and shortlisted the companies that are at the forefront of tackling challenges in the supply chain arena. A distinguished panel comprising of CEOs, CIOs and analysts including CIOReview’s editorial board has selected the final list of Supply Chain Solution Providers 2016. The selection is based on the vendor’s capability to offer cutting edge technologies and solutions that add value to the supply chain landscape. We present to you CIOReview’s 20 Most Promising Supply Chain Technology Solution Providers 2016.